I doubt too many people have a jar of good old fashioned blackstrap molasses lying around in their kitchen these days. But if you knew what grandma did, you’d probably stock up on it, big time. It’s a healing superfood. Molasses is the byproduct refined sugar cane, which is rich in nutrients. In the process of refining the cane, the juice is pressed from the plant, then boiled to make refined sugar crystals. The crystals contain very few minerals. 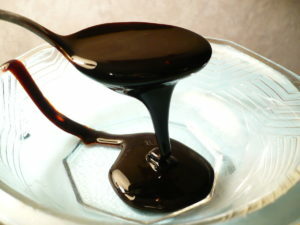 It’s the dark, syrup from the juice, known as molasses, that contains all the goodness absorbed by the plant. You have to boil the juice three times to unlock most of the sugar cane’s trace minerals and nutrients. This highest grade of molasses is known as “blackstrap”. I include blackstrap molasses into my daily food regimen because of its high mineral content and it’s so inexpensive! It’s rich in iron, calcium, magnesium, copper, selenium, manganese and lots of other minerals. Blackstrap is sweet, yet low on the glycemic index. It can help regulate blood sugar and blood pressure. It’s even been known to boost energy, color your gray hair over time, alleviate menstrual cramps, shrink enlarged prostates and heal a host of other ailments. I told a friend to try taking Blackstrap molasses for his enlarged prostate. week later he called to tell me that after taking a tablespoon in hot water with some cinnamon every day, he noticed his frequent urination urges were greatly reduced. I told another friend who had high blood pressure to start taking blackstrap molasses as a sweetener substitute in her tea. At the time, her doctor had increased her blood pressure pills to manage her pressure. She started drinking it as a tea. Months later, she told me that her blood pressure is now so low that her doctor has lowered blood pressure medication. She said she knew it was the molasses because that’s the only thing she changed in her diet! Blackstrap seems to work by filling in nutritional gaps that cause ailments as we age. I like drinking blackstrap molasses tea as a nutritional supplement, instead of taking vitamin supplements. I’ve noticed that when I take it at night with hot water, coconut oil and a dash of salt, I sleep deeper and better. So now I use it to sweeten my smoothies too. Plus, it’s cheaper than raw honey. If you decide to try blackstrap molasses, make sure it’s organic or unsulphured. Sulfured molasses are treated with sulfites, so much of its nutritional content is lost. If you’re taking blackstrap molasses and you’ve noticed health benefits, comment below and share your story. I’d like to help others by sharing easy, affordable and holistic remedies, so please post your stories or share your remedies! This sounds great coming from a history of high blood pressure, I can’t wait to try this molasses. I definitely will let you know after I try it. Interesting info…I have heard lots of good things about molasses; are there any sources that support these claims? Hi Mike, I did some digging and found references to several studies that support the high level of trace minerals and nutrients (i.e. iron, calcium etc.) present in blackstrap molasses. But one in particular goes a step further; according to a study published in the Journal of the American Dietetic Association in 2009, blackstrap molasses have more antioxidants than most other sweeteners. Antioxidants kill free radicals that can cause disease, so that’s a proven benefit. Time to jump on the blackstrap molasses train. :-) Hope this helps, and thanks for posting! WOW! Who knew that molasses had so many health benefits! Very informative …. Keep in mind, this article isn’t about just any molasses. It’s specifically about blackstrap molasses, which is fantastic. And you’re absolutely right, Todd! There’s a world of difference between the two with blackstrap molasses being the superior product with tons of trace minerals. I still use it regularly in ny smoothies as a superfood vitamin. Just tried it last night. Had deep sleep and no low fever in middle of the night from recent virus that I caught. Am taking it for iron content. Took first dose early evening last night. I took one tablespoon just before a meal. Would like to continue! I’m so glad you’ve discovered this easy superfood! It’s wonderful to know this article is still helping others. I got my mom hooked on it because she had high blood pressure, and the molasses is said to regulate it. After much arm-twisting, she started a regimen of drinking her molasses tea nightly before bed. Now she tells everyone she knows how powerful it is and how it brought down her pressure. Thanks so much for sharing your personal experience with this awesome food. I have not started taking it but I know it will cure my High Blood Pressure 140_170 @ 68 years.I am writing from Nigeria my country. How do I get it here in my country Not Nigeria? I aso have enlarged prostate with 5PSA and would like your recommendation.I pass urine uncontrollably at times …very embarrassing.